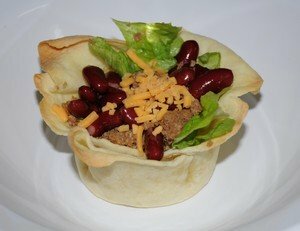 Making homemade taco salad bowls can add a little fun to a traditional taco night. You can make it easier and faster by using store bought tortillas but we'll show you how to make it with fresh homemade tortillas as well. 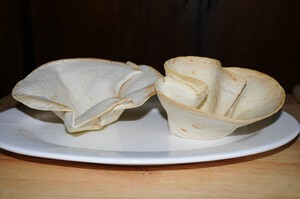 To prep your taco salad bowls, you will need ramekins or small bowls that are oven safe or tin foil. 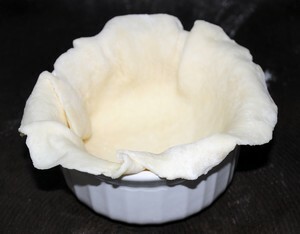 Spray each tortilla with cooking spray front and back and place your tortilla inside your ramekin or oven safe dish. Making sure top edges lap around the edges. If you don't have ramekins or oven safe dishes, wad a sheet of tin foil into a loose ball. 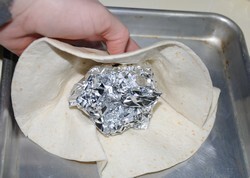 Wrap tortilla around tin foil ball and place tin foil side down on a cookie sheet. 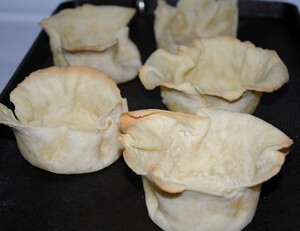 You can warm up store bought tortillas for several seconds in the microwave and they will form more easily around the ball or inside the bowls. Bake in the oven at 450 degrees F for 10-15 minutes or until golden brown. Allow to cool slightly and take out of dishes. Brown ground beef or ground chicken until no longer pink. Season with salt and pepper and taco seasoning mix. Now prep your taco salad ingredients by draining canned corn, beans and olives. Chop peppers and tomato. Let each family member assemble their own salad in their homemade tortilla bowl. Top with shredded cheese, taco sauce, salsa, sour cream or salad dressing, if desired. Learn how to make homemade flour tortillas now!